Are the electronic products available for immediate download after purchase? Yes. Once payment has been accepted you will be redirected to a confirmation page showing your order number and providing a download link. I did not download my order(s) from the confirmation page. How can I download my item(s) now? Each download order is added to your shop account. 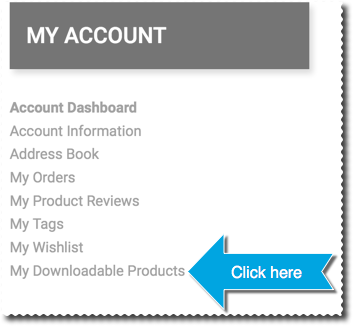 To access your download area, ensure you are logged in and click 'My Account' from the shop dropdown menu. You will now be taken to the 'My Dashboard' page where you will see a list of links under 'My Account'. You will now be on the 'My Downloadable Products' screen. Your download orders can be downloaded from this page. You will receive an order notification email after each order. This will be sent to the email address you used when ordering the item and will contain a download link.